It’s BBQ season! Why not experiment with sustainable seafood and try something a little different on the grill, like Dungeness crab. While Dungeness crab is easy and quick to prepare, it certainly is a mess to eat, so set up your patio table, grab your bibs and get cracking! 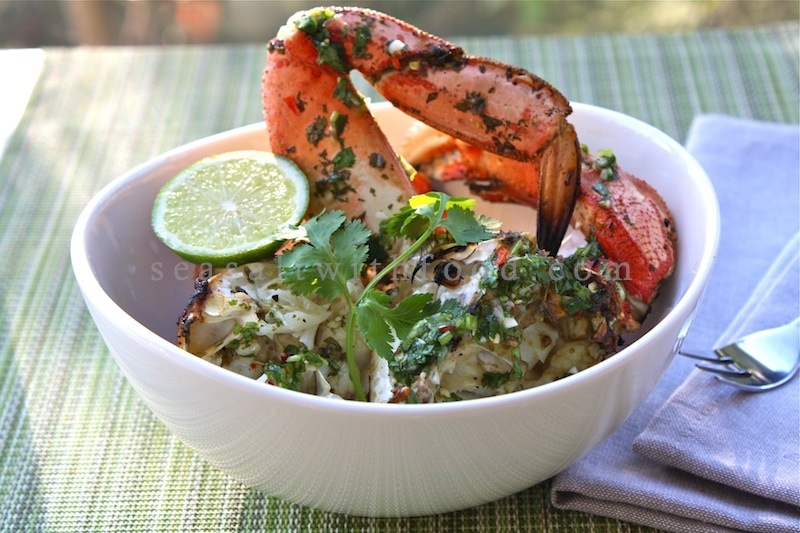 This grilled crab recipe is adapted from local food blogger Sea Salt with Food. Combine all the chili lime ingredients and whisk well. Brush the crab pieces lightly with some oil. Grill the crab pieces over high heat for about 3 to 4 minutes on each side. Remove the crab pieces from the grill and place them into the aluminum pan. Toss the dressing all over the crabs. Return the aluminum pan to the grill over direct high heat and gently turn the crab pieces with a tong to coat them with the chili lime dressing. Cook the crab pieces for about 3 minutes or until the crab is fully cooked. Serve immediately. *If you are working with live crab, be sure to cook them in boiling water until they turn a rich shade of orange. Remove them from the water and wait for them to cool before cleaning and cutting to them into the pieces required for the recipe. Adjust your grilling time to not overcook them.